Join Jugat Guru Singh Khalsa (of Chardikala Jatha & Principal of Miri Piri Academy) in Espanola, New Mexico, in the company of the Sadh Sangat, to perform the deep meditation of 11,000 repetition of this beautiful Shabad in praise of Guru Ram Das. This Shabad is found on page 1402 in the holy Siri Guru Granth Sahib ji. Together we’ll sit for five days until 11,000 repetitions have been completed for a total of about 67 hours. Unlike any other course you have taken, during the days of the meditation the only teacher is the magnificent Shabad Guru itself. You go at your own pace, and keep track of your own time. But, you need to get 17 hours of chanting in per day to finish by Friday morning. A recording of the shabad will be playing continuously, 24 hours a day once the meditation the starts. Jugat Guru Singh Khalsa will sit at the front of the room, holding the space and facilitating the meditation. You are welcome to pace yourself in order to get the 17 hours you need for that day. In the remaining 7 hours, you can bath, sleep, and eat. This is a very deep and serious meditation for conscious people who have a strong spiritual discipline. 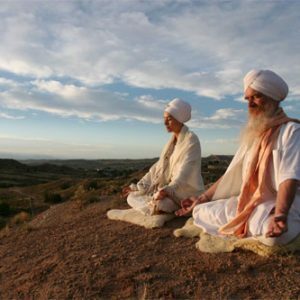 My husband, Tyaga Singh, and I, along with about 15 other Gursikhs and yogis, completed this meditation last summer under the guidance of Gurudev Singh. I found it truly remarkable and one of the most impactful experiences I have had on the spiritual path. When you immerse yourself so completely in the Shabd Guru, your consciousness shifts and responds to the vibration. Speaking for myself, I have had two lasting effects from this powerful meditation. First, I have gained a new awareness and perception of what is reality, and what is just the masked illusion of maya. The “chatter” in my mind has stilled, and I see the world around me in a clearer way. I think this has allowed me to react less to my environment, to be hurt less, to be “fooled” less, and therefore betrayed less. I value this perspective deeply, both in my personal and professional life. Second, it has changed my relationship with my Guru completely. I have always been a Sikh of the Siri Guru Granth Sahib – without question. But I have to be honest; the Shabd has been for me a Guru of “convenience”. When I needed direction, inspiration, comfort, or guidance – the Guru was always there. But if I was busy or distracted, the Guru could be quietly ignored. But now that has all changed for me. The Shabad penetrates my cells and guides me in ways I could never have anticipated. I am enchanted and enthralled with the ways of the Shabad Guru, and bow in humility to the power and vastness of my Guru. For more details and to register on-line go to http://www.espanolaashram.com/pages/visitors/kundalini_surjhee.php Because this is an intensive meditation gathering it is recommended that you attend this meditation only if you have experience with meditation or yogic practice. Please only consider yourself registered for this event only upon return acceptance of your application. On-site registration and assignment of housing will happen on Sunday, May 9th after Langar. There will be an orientation Sunday at 6:00pm in the Langar hall where Jugat Guru Singh Khalsa will talk about the week and give you an idea on what to expect. The meditation will start on Monday, May 10th at 4:00AM with Japji Sahib, and continue until Friday morning at 7:00AM when we will end with Japji Sahib. Ashram housing is available for about fifty participants. These are simple, clean, double-occupancy rooms within walking distance from the meditation hall. Light and simple vegetarian food and tea will be served throughout the course. The cost of this meditation is $399 which includes meals and shared accommodations. If you don’t need accommodations you will receive a $100 credit. The event manager is Jaap Kaur, and she can be reached at [email protected]. I’m looking forward to this experience, and I hope to see some of you there. Sat Nam, and sorry for the long email! Gurmustak Singhji, the path of true Guru is the path of ease and it has no concern with so called Kundlini described in Yoga. Meaning of the hymn lines quoted does not comply the philosophy of true Guru, Kundlini means the complications(doubts) and Surjhee means resolved, therefore it is not like that in Yoga. This way the Kundlini will never rise even if one recites above lines for 11 crores times and rather for whole of the life. Whole of teachings of true Guru indicate to chant / contemplate the name of Lord God, Waheguru for Sikhs and other names for people of other religions and the goal is union with Lord God and not to awaken the Kundlini. They who realise the Divine discourse of the Eternal Lord like Dhru, those men escape from dying ignoble death. They cross the terrible world ocean in a moment, God has created the world like the bubble of water. Associating with the saints, their mind’s tongue is opened and through the supreme Guru, they through the supreme Guru, they enjoy, the Lord of supreme bliss. The venerable Great Guru is over and above all, so serve thou the True Guru, with thy though, word and deed. à¨œà¨¿à¨¹ à¨¸à¨¿à¨®à¨°à¨¨à¨¿ à¨¹à©‹à¨‡ à¨®à©à¨•à¨¤à¨¿ à¨¦à©à¨†à¨°à© à¥¥ Remembering whom thou shalt obtain the gate of emancipation, à¨œà¨¾à¨¹à¨¿ à¨¬à©ˆà¨•à©à©°à¨ à¨¿ à¨¨à¨¹à©€ à¨¸à©°à¨¸à¨¾à¨°à¨¿ à¥¥ go to the True Abode and return not to this world, à¨¨à¨¿à¨°à¨­à¨‰ à¨•à©ˆ à¨˜à¨°à¨¿ à¨¬à¨œà¨¾à¨µà¨¹à¨¿ à¨¤à©‚à¨° à¥¥ play the trumpets in the house of the Fearless Lord, à¨…à¨¨à¨¹à¨¦ à¨¬à¨œà¨¹à¨¿ à¨¸à¨¦à¨¾ à¨­à¨°à¨ªà©‚à¨° à¥¥à©§à¥¥ and the unstruck strain shall ever fully resound for thee. à¨à¨¸à¨¾ à¨¸à¨¿à¨®à¨°à¨¨à© à¨•à¨°à¨¿ à¨®à¨¨ à¨®à¨¾à¨¹à¨¿ à¥¥ Embrace thou such meditation within thy mind, à¨¬à¨¿à¨¨à© à¨¸à¨¿à¨®à¨°à¨¨ à¨®à©à¨•à¨¤à¨¿ à¨•à¨¤ à¨¨à¨¾à¨¹à¨¿ à¥¥à©§à¥¥ à¨°à¨¹à¨¾à¨‰ Without the Lord’s contemplation, salvation can never be attained to. Pause. Thanks for this information. It is certainly intriguing. Does anyone know any more details about the recording of the shabad which will be playing continuously? I would like to find the version that will be used and begin listening to it now. Thank you. I enjoyed your post and although I think there have been a lot of liberties taken in the translation you posted, I still benefited from it. For me personally, I find a lot of Christian reference points in Bhai Manmohan Singh ji's translations – and so I approach this with caution. I do not mean to disparage his good work in ANY way, however. In fact, our sangat in Espanola uses his translation in our weekly Akand Path Sahib. The reason for my comment is this: Whether you say "doubts are dispelled" or "kunalini rises", I believe we are actually saying the same thing with different vernacular. We are talking about that amazing experience that happens through simran by the grace of the True Guru – chhardi kala. The Siri Guru Granth Sahib refers to this in many ways – such as Kamal Bigasai. When chanting, austere meditation and self-discipline become your protectors, then the lotus blossoms forth, and the honey trickles out. I believe we are meaning the same thing, if not saying the same thing, and the difference is in language and cultural details. I CONGRATULATE YOU & WISH THE SUCCESS OF THIS PROGRAM. Description of your mail concludes that jaap of just one shabad of gurbani is so powerful that it changes lives. So we can are very little & helpless to understand powers & blessings of the GURU GRANTH SAHIB as a whole. I want share my experience…in 1995 when i was posted atsome remote triibal place i got some time to read/understand very little about gurbani. Few words from SUKHMANI SAHIB "Das bastu lai pache pawe, ek bast karan bikhot gawawe…….." These lines changed my life with a great impact on my thinking by strengthening my belief on the almighty & his blessings with a feeling of thankfulness as well as feelings of satisfaction. We must encourage gurbanibut our efforts should not give a message that this shabad is stronger than other. whole gurbaniis equally effective if we could understand. à¨‰à¨ªà¨°à©‹à¨•à¨¤ à¨¤à©‹à¨‚ à¨¸à¨šà©‡ à¨—à©à¨°à©‚ à¨¦à©‡ à¨¸à©°à¨¦à©‡à¨¸à¨¼ à¨¦à¨¾ à¨ªà¨¤à¨¾ à¨²à¨—à¨¦à¨¾ à¨¹à©ˆ à¨•à©‹à¨ˆ à¨µà©€ à¨¸à©°à¨¸à¨¾à¨°à¨• à¨®à¨¨à©‹à¨•à¨¾à¨®à¨¨à¨¾ à¨²à©ˆ à¨•à©‡ à¨ªà¨¾à¨ à¨•à¨°à¨¨ à¨œà¨¾à¨‚ à¨ªà©à¨°à¨­à©‚ à¨¨à¨¾à¨® à¨¸à¨¿à¨®à¨°à¨¨ à¨•à¨°à¨¨ à¨¨à¨¾à¨² à¨‡à¨›à¨¾ à¨ªà©‚à¨°à©€ à¨¹à©‹à¨‚à¨¦à©€ à¨¹à©ˆ à¨ªà¨° à¨®à©à¨•à¨¤à©€ à¨•à©‡à¨µà¨² à¨¨à¨¾à¨® à¨œà¨ªà¨£ à¨¨à¨¾à¨² à¨¹à©€ à¨®à¨¿à¨²à¨¦à©€ à¨¹à©ˆ. Maharaj ji says, "ek shabad mere praan vasat hai bohut janam na ava." if one shabad resides with in my breath, never shall i be born again. Even the mahapurkhs in India will give a certian shabad for a certain effect. Here this shabad will be used to for a certain desired effect. All should be happy that in midst of kalyug, there are blessed ones who are chanting gurbani. everyone's path is different, but the destination is the same. Don't knock anything without trying it. I have attended four summer solstices to date. In the first solstice my attitude was let me go and see what these American Sikhs are doing. I did attend few classes but did not tke them seriously. I did attend the Whte Tantrik for three days. On the day two at night I was in lying my tent, the flies were open I could see the sky full of stars. All of a sudden I felt a kick in my belly and I started crying as I had never done before. I remember Guru Sangat Kaur Khalsa of Brazil came to lookout for who ever was wailing in so much pain. When she woke me up I felt a kind of releaze that I never had in my life. Just forteen months before the solistice I had been homeless, in a hit , divorced while I was still in the hospital. Thanks to Akasha Kaur Akasha Singh Khalsa family for putting me back into shape and changing my life with Holy Naam and Kundalini yoga. I was already a practicing Sikh but they helped refine my understanding of my faith. I did not even know the meaning of "Kaur" . I was busy putting my life together, walking again was the biggest feat. I never actually got time to grieve and it was not in my agenda. But it is required. The continous chanting of shabads for 62 minutes at the White Tantrik just blew away my mind. All the hurt and anger even from the remote past was washed away and I felt peaceful like never before. Next year I again did White Tantrik but was still skeptical about other things especially Kundalini Yoga. The third year I got more clarity, as I chanted mool mantra for 62 minutes straight. My mind was open all my doubts were dispelled I felt light. I realized White Tantrik at the Summer Solistice is like my Holy Naam Bank. The amount (reciting naam with contemplation) I deposit in those three days thousand time more I withdraw for the whole year. Last year I travelled in the police car for two and half hours without handcuffs on my way to Summer solsctice. I could feel the energy and mercy of Guru Ramdas and bani guiding my way through the obstacles (I was detained by border patrol for I look like Mexicans and my visa status, they escorted me to LA for I missed my bus in their inquirey process). This time again we did 62 minutes of Gobinde Mukande… with closed eyes. The more I chanted the more I became aware of my self and the creator. If you sit at one place with closed eyes and all you do is chant you'll definitely contemplate on something if not all. If someone calls it Kundalini then let that be. If it is an entanglement of mind and emotions so be it. The idea is to dispell doubts and feel the majesty of holy Naam. All those who will do this course will emerge with a newer consciousness and awareness. I am 100% desi (Indian) I still have my days when I do not believe in Kundalini Yoga and most of the time I do not, I use it as a tool to recite shaloks. So does it change the fact that repeating one matra in Sangat changed my life? No. Would I have done this one my own? No. I needed like minded company (Gurmukhs= people who look for direction from the Guru; I refrain from using the word Gursikh because some people think it is reserved for those with Turbans). Have I been able to convince other Desis to come to the summer solsctice? No. Will they come? That is up to them and their Karma if it brings them to Ram Das Puri. It is futile debate if it is Kundalini yoga or is chanting. Here Kundalini Yoga is a medium to recite the holy Naam for X number of hours. Let me assure you the fee for attending the course is not for making money. It barely covers the food and maitenance of the camp grounds. Where do you think the money for sewerage services will come from? Where will the food come from? I have mentioned my journey of skepticism about this whole process called kundalini Yoga. It took me four years to experience that, without the medium of Kundalini Yoga it is difficult to motivate 1750 people from across the globe to come and camp on the mountain top in 120 F, year after year. Karanvir Singh ji Waheguru ji ka khalsa sri Waheguru ji ki fateh. Its ironical that we are being confused in understanding the essence of teachings of true Guru, Guru Granth Sahib. what you have quoted ‘Shabad’ means Guru Mantra, Waheguru for Sikhs. à¨…à¨ªà¨œà¨¸à©° à¨®à¨¿à¨Ÿà©°à¨¤ à¨¸à¨¤ à¨ªà©à¨¤à©à¨°à¨¹ à¥¥ Bad reputation of a true son of Lord God, is erased. à¨¸à¨¿à¨®à¨°à¨¤à¨¬à©à¨¯à©à¨¯ à¨°à¨¿à¨¦à©ˆ à¨—à©à¨° à¨®à©°à¨¤à©à¨°à¨£à¨¹ à¥¥ who meditates in his heart on the Guru’s Mantra. Founding dharamsala, the place for dharma, the place of Lord God, it was inhabited by the Holy Congregation as the abode of Truth. Sir generally the word à¨¬à¨¾à¨£à©€ or à¨—à©à¨°à¨¬à¨¾à¨£à©€ has been used for scripture, the preaches the teachings the hymns of true Guru, in Guru Granth Sahib and à¨—à©à¨° à¨®à©°à¨¤à©à¨° or à¨—à©à¨° à¨¸à¨¬à¨¦ or à¨¸à¨¬à¨¦ is used for name of Lord God Waheguru for disciples of Guru Granth Sahib. Guru-mantar is Waheguru, whose recitation erases egotism. Here it is also said, à¨ªà©à¨°à¨­ à¨•à¨¾ à¨¸à¨¿à¨®à¨°à¨¨à© à¨¸à¨­ à¨¤à©‡ à¨Šà¨šà¨¾ à¥¥ (The remembrance of God is the highest and most exalted of all.) Therefore the meaning of shabad you have quoted would be as. My body is clothed with the mendicant’s dress, my mind is the temple and I bathe in my heart’s pilgrim’s place. The One Lord’s Name abides in my mind and I shall not be born again. à¨•à¨°à¨¨à¨µà©€à¨° à¨¸à¨¿à©°à¨˜ à¨œà©€, à¨•à©‹à¨ˆ à¨—à©à¨¸à¨¤à¨¾à¨–à©€ à¨¹à©‹à¨ˆ à¨¹à©‹à¨µà©‡ à¨¤à¨¾à¨‚ à¨®à©à¨†à¨«à©€ à¨šà¨¾à¨¹à©à©°à¨¦à¨¾ à¨¹à¨¾à¨‚, à¨¦à¨¾à¨¸à¨¨ à¨¦à¨¾à¨¸ à¨œà¨—à¨œà©€à¨¤ à¨¸à¨¿à©°à¨˜.